When you travel to PAX East, you always anticipate the Devolver Digital booth to be jammed with indie delights, and this year was no different. What I wasn’t expecting though, was the four player frenzied delight that was officially unveiled and announced on day one of PAX East– Heave Ho. Displayed on a large screen with a couch in front of it, this physics based, co-op adventure was drawing a crowd all weekend long– deservedly so. Heave Ho is the next big game from French studio Le Cartel whom you may know from the indie beat ’em up Mother Russia Bleeds. Though the studio is the same, Heave Ho is nothing like their previous outing both in genre and style. Featuring co-op play for up to four players and a variety of modes both competitive and teamwork oriented play, Le Cartel set out to bring a different type of experience to gamers this time around. My initial playthrough was with Alexandre Muttoni, one of Heave Ho‘s developers, as he was teaching me the basics of the game he invited three other players over onto the couch to play along with me. While choosing my rotund hero I noticed that the customizations in this game not only offer you the ability to swap out different parts of your two limbed creature but some of the costumes actually serve as nods to other well known video game characters. The controls in Heave Ho are simple, you use the left analog stick to maneuver your legless character and the left and right triggers to grab with the corresponding hand. In the main mode of the game, you and your friends are working together to scale across the open pits of death, dodging spikes, and utilizing each other to get your whole team to the goal of each stage. Though this may sound like a generic premise, the Snipperclips-esque charm of the facial expressions on your character, the gameplay and puzzle solving built around a responsive physics engine, and the adrenaline rush of completing levels while working together is something that is often not present in many games today. Especially since solid couch co-op experiences are few and far between, Heave Ho stands out for executing the concept impeccably. After successfully completing a few levels and falling in love with the concept, Alexandre invited me to come back later in the day with the rest of Pass The Controller to play a four player session with them because he believes the game truly shines when you are playing with your friends. He was absolutely right. From the moment we sat down to choose our characters we were all laughing at the bevy of choices to outfit ourselves and the rest of Pass The Controller was anxiously awaiting to play since they were intrigued by the premise I had previously filled them in on after I had a chance to play Heave Ho earlier that morning. After everyone else got a hang of the controls– or so we thought– we moved on to the first level. Commence the madness. Whether it was intentional or not, the four of us were continually sabotaging each other’s progress which immediately resulted in flips and flops to our death, uproarious laughter, and pride to be the first one to the goal– even though it was a non-competitive mode. Our time shared on the couch all playing together solidified in my brain right there that Heave Ho would be the next great four player party game. On one of the stages, Dom and I were attempting to shuffle Mike and Joe along. The level started us along a flat platform in the top left corner that we then had to shimmy our way off and grab onto a long downward surface, and eventually make our way to the bottom right corner where the goal was floating. After successfully helping Mike and Joe reach the goal, Dom and I were working on getting ourselves there. Our initial attempt was a long swing off of the edge, where we were hoping to use our collective weight and additional reach– since we were holding onto each other– to launch ourselves over to the goal. Dom made it. I plummeted. Everyone erupted, including the people who were packed into the Devolver Digital booth to watch and queue up to play next. Now it truly sunk in that Heave Ho was something special, a game that with its simple concept can enrapture not only the people playing but invest the collective emotions of everyone who was watching. Even if the bystanders didn’t understand the game or mechanics, Heave Ho does a fantastic job of conveying victory and loss that everyone can elicit. With a low barrier of entry for unskilled players, and a high skill ceiling to pull off insane runs through levels with friends, Heave Ho exists in a space that will accommodate all types of play sessions from a casual gathering of friends to high level stunts for the world to see on streaming platforms. 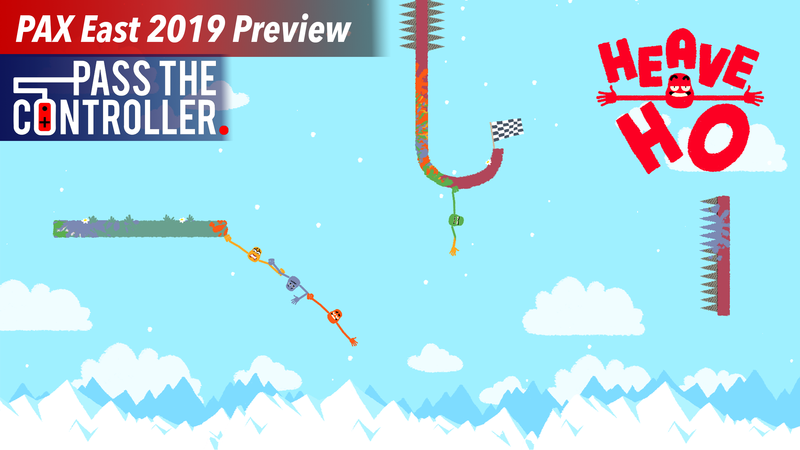 The next big party hit, Heave Ho was an absolute treasure on the show-floor this year at PAX East, a recipient of one of our Best In Show awards, and a game that is for sure on our must buy lists when it drops later this year. For all things Heave Ho and indie game related make sure to keep it locked to Pass The Controller– and for a deeper dive into all things gaming and nerd culture make sure to listen to the Pass The Controller Podcast with new episodes weekly and join our Discord community to keep the conversation going!